VATICAN CITY (CNS) -- The Vatican has billed Pope Benedict XVI's four-day visit to Great Britain as a trip to beatify the 19th-century intellectual and theologian Cardinal John Henry Newman. But the pope's schedule for the September visit is filled with other appointments as well, including a meeting with Queen Elizabeth II, with the British prime minister and members of the government's opposition parties and with Anglican Archbishop Rowan Williams of Canterbury, spiritual leader of the worldwide Anglican Communion. The beatification Mass on the last day of the pope's Sept. 16-19 visit to Scotland and England will be the first beatification liturgy Pope Benedict has presided over; since his election in 2005, he has delegated that role to cardinals to highlight the difference between beatification and canonization. Here is the schedule for the pope's trip as released by the Vatican Aug. 18. Times listed are local, with Eastern Daylight Time in parentheses. -- 8:10 a.m. (2:10 a.m.) Departure from Rome's Ciampino airport. -- 10:30 a.m. (5:30 a.m.) Arrival at Edinburgh Airport. Official welcome. -- 11 a.m. (6 a.m.) Welcoming ceremony at the Royal Palace of Holyroodhouse in Edinburgh. Visit with Queen Elizabeth II. -- 11:40 a.m. (6:40 a.m.) Meeting with authorities in the park of Holyroodhouse. Speech by pope. 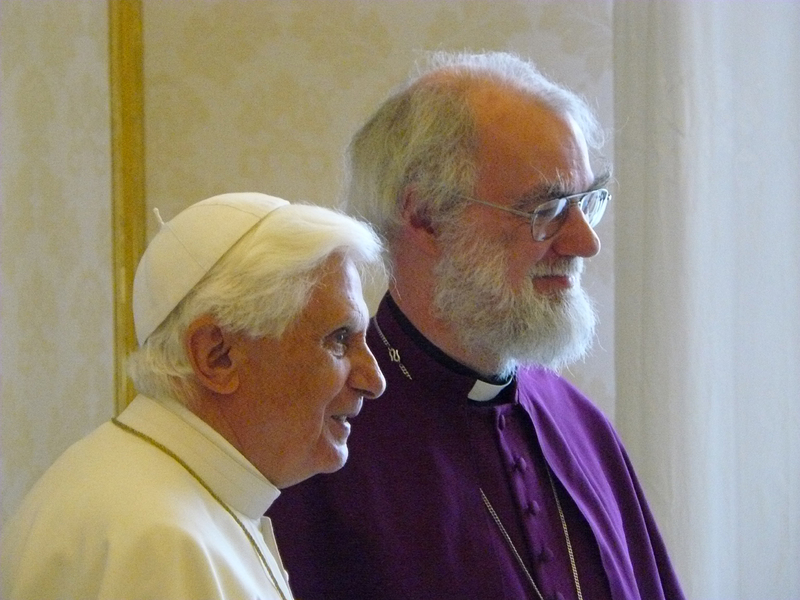 -- 1 p.m. (8 a.m.) Lunch with members of the papal entourage in the archbishop's residence in Edinburgh. -- 5:15 p.m. (12:15 p.m.) Mass in Bellahouston Park in Glasgow. Homily by pope. -- 8 p.m. (3 p.m.) Departure from Glasgow Airport for London. -- 9:25 p.m. (4:25 p.m.) Arrival at London's Heathrow Airport. -- 8 a.m. (3 a.m.) Private Mass in the chapel of the apostolic nunciature in Wimbledon. -- 10 a.m. (5 a.m.) Meeting with staff and students of Catholic schools in the chapel and on the sports field of St. Mary's University College in Twickenham. Greeting and speech by pope. -- 11:30 a.m. (6:30 a.m.) Meeting with leaders of other religions in the Waldegrave Drawing Room of St. Mary's University College. Speech by pope. -- 4 p.m. (11 a.m.) Courtesy visit with the Anglican archbishop of Canterbury at Lambeth Palace. Speech by pope. -- 5:10 p.m. (12:10 p.m.) Meeting with representatives of British society, the academic, cultural and business spheres, members of the diplomatic corps and religious leaders in Westminster Hall. Speech by pope. -- 6:15 p.m. (1:15 p.m.) Ecumenical celebration in Westminster Abbey. Speech by pope. -- 9 a.m. (4 a.m.) Meeting with the prime minister in the residence of the archbishop of Westminster. -- 9:20 a.m. (4:20 a.m.) Meeting with the deputy prime minister in the archbishop's residence. -- 9:30 a.m. (4:30 a.m.) Meeting with leaders of the opposition in the archbishop's residence. -- 10 a.m. (5 a.m.) Mass in Westminster Cathedral. Homily by pope. -- 5 p.m. (Noon) Visit to St. Peter's Residence, a home for the elderly. Speech by pope. -- 6:15 p.m. (1:15 p.m.) Prayer vigil for the beatification of Cardinal John Henry Newman in Hyde Park. Speech by pope. -- 8 a.m. (3 a.m.) Departure from the apostolic nunciature in Wimbledon. -- 8:45 a.m. (3:45 am.) Departure by helicopter from Wimbledon Park to Birmingham. -- 9:30 a.m. (4:30 a.m.) Arrival at the heliport near Cofton Park in Birmingham. -- 10 a.m. (5 a.m.) Mass and the beatification of Cardinal Newman in Cofton Park. Homily by pope. Recitation of the Angelus prayer. Remarks by pope. -- 1:10 p.m. (8:10 a.m.) Private visit to the Oratory of St. Philip Neri in Birmingham. -- 1:45 p.m. (8:45 a.m.) Lunch with the bishops of England, Wales and Scotland and with members of the papal entourage in the refectory of Francis Martyn House at Oscott College in Birmingham. -- 4:45 p.m. (11:45 a.m.) Meeting with the bishops of England, Wales and Scotland in the chapel of Francis Martyn House. -- 6:15 p.m. (1:15 p.m.) Farewell ceremony at Birmingham International Airport. Speech by pope. -- 6:45 p.m. (1:45 p.m.) Departure from Birmingham International Airport. -- 10:30 p.m. (4:30 p.m.) Arrival at Rome's Ciampino airport. thanx Mary...I'll be lifting this meeting between Pope Benedict & the Anglican Archbishop of Canterbury in prayer in my continued longing that we all become One under our precious Lord Jesus. hope the pope can encourage RW to repent of his own actions in ordaining people who were unrepentant and open with him about that.....but he did it anyway.....and that explains his unwillingness to discipline TEC revisionists in the last 7 years...he agrees with them. Biblical Protestants reject the teaching of the Pope and his Roman Church regarding the way of salvation. We assert that Rome's gospel is not simply questionable, but totally false. We do not deny that there are genuine Christians within the Roman fold, but they are the despite Rome's official teaching and not because of it. Any church which emphatically denies the biblical doctrine of justification by faith alone preaches another gospel which is no gospel at all. There can be no room for nuance and fudge at this point - the salvation of eternal souls is at stake. I am confused. Does RMBurton, in fact, speak for all Biblical Protestants? Do you believe that the Roman Church professes justification by faith? How do you define Protestant and would you identify yourself as one? I invite you to read my blog, the Thin Tradition (http://frdanweir.blogspot.com/) and see if you would identify me as a Protestant. I am unwilling to define such terms myself. My initial response was not to your critique of Roman Catholic teaching, but a comment on your assertion that you spoke for Biblical Protestants. I find it better, for myself at least, to speak only for myself. I have been giving some thought to the question raised by RMBrunton and want to make two comments. Given the joint Roman Catholic-Lutheran Declaration on Justification, I am not at all sure about the assertion that the Roman Church does not teach justification by grace alone. Certainly I find that teaching reflected clearly in the Roman Catholic theologians I read. More important to me is the question about how we think/speak/write about churches other than our own. I tend to avoid saying much about those churches, taking as my model Bonhoeffer who refused to label the Nazi's church as false, but simply pointed to the marks of the Church that he believed - rightly, I think - in the Confessing Church. It was one thing for Luther to dispute with Rome while he was still in that church, and quite another for those of us in other churches to continue the debate in ways that suggest that we are defining ourselves over against Rome. I believe that the freedom that we enjoy in Christ is a freedom from ever defining ourselves as "not something." I prefer to accept the definition that Jesus has given me - forgiven sinner, child of God, inheritor of the Kingdom.